Setting up e-mail is yet another important milestone that needs to be accomplished sooner than later when you get a new smartphone. The process was easy and within minutes I was reviewing my e-mails on the Samsung BlackJack and able to reply to them. First I setup the size limit to 500 bytes per message, but then I found myself constantly having to retrieve more of the message to make sense out of it, so I decided to go for the 5000 bytes limit. E-mail can be setup to retrieve messages from a variety of e-mail accounts including corporate accounts, and when used in conjunction with Microsoft Exchange and the necessary server software, you have the option of having your e-mail synchronized wirelessly with the Exchange Server. This can transform your Samsung BlackJack (or any Windows Mobile device) into a BlakBerry like environment. I was hoping that the 3G network will make browsing extremely fast, and that browsing would be smooth and efficient. These hopes, or maybe expectations, made the 3G experience somehow disappointing. 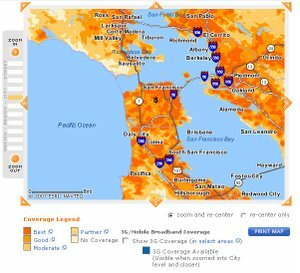 First of all, and as I mentioned yesterday, I was only able to get the 3G signal sporadically (even though the map shows pretty good coverage in the San Francisco area). This in and by itself is a bit disappointing. Second when I was in an area where 3G was available, the browsing didn’t seem to be much faster or at least not consistently faster than the browsing at the EDGE speed. The moral of the story is that, until the Cingular 3G network is more widely available and performing more consistently, you may want to keep your expectations low, in which case you may be pleasantly surprised rather than disappointed. Another observation here is that if speed is one of your top priorities, you may want to explore what Verizon and Sprint have to offer is this area. Press and hold the End key to lock the device, the phone key to activate the speakerphone, and the home key to get to the task manager. These are only a few of the many helpful shortcuts that I am learning as I continue to explore the Samsung BlackJack. Most of the shortcuts and other helpful tips are outlined in the quick reference card that comes with the device. Overall, my experience with the Samsung BlackJack has been pretty encouraging so far. The BlackJack is small and slick and can very easily slip into your pocket or purse. It is the kind of device that you can happily take with you to a social event and yet rely on it for your serious business activities. It is not a laptop replacement so you won’t be able to create and edit document like you would with the Pocket PC smartphones. But this may not be what you need anyway! The 81-day-experiment continues with the Samsung BlackJack from Cingular—Day #2, camera, battery, 3G coverage map, Motorola S9 headset, and more! It is nice to have a built-in camera in the smartphone again. The BlackBerry 8800, which I have used recently, does not have one, but the Samsung BlackJack that I am using now comes with a 1.3 mega pixel camera. It also comes with video recording capabilities if you’re interested in fully capturing the moment and documenting what is happening. I made my first call today, and I charged the battery. The blackjack came with two battery packs. One being the regular size battery and the other being an extended battery. If you use the extended battery, which is slightly thicker than the regular one, you need to use a different back cover which is also provided. For now, I am going to use the regular battery (and therefore keep the device thin and elegant) but if necessary, I will switch to the extended battery later. The Samsung BlackJack didn’t come with one. So I decided to order the Motorola S9 Bluetooth stereo headset (picture on the left). Having gotten used to the stereo headset that came with the T-Mobile Dash, I wanted to continue with a stereo headset. I felt that the Stereo headset transformed the phone experience into a more pleasant one. I am hoping that the Bluetooth stereo headset will take this experience even further. And don’t forget the cables! Once again (similar to what I mentioned when I was using the Treo smartphones, Cingular 3125, and the Nokia E62 in the early days of the 81-day-experiment), the Samsung BlackJack comes with proprietary cables. So don’t leave home without them! Another visit to the Cingular store, and this time Ernest helped me with the Samsung BlackJack. The Samsung BlackJack resembles the Motorola Q especially the Motorola Q Black that was released late last year. I am eager to find out how it compares with the Motorola Q and T-Mobile Dash which I have used previously in the 81-day-experiment. At least for now and until I gain more experience with the BlackJack in the next 9 days, my expectation is that my experience with the Samsung BlackJack from Cingular is going to be very similar to that with the Motorola Q from Verizon and Sprint, and the T-Mobile Dash from T-Mobile. It seems to me that if you are in the market for a “light” Windows Mobile smartphone, and if you are a Verizon or Sprint customer (and would like to continue with their service), you are likely to pick the Motorola Q, and if you’re a T-Mobile customer and want to stick to T-Mobile, you are likely to go with the T-Mobile Dash, and similarly if you are a Cingular customer, you are likely to go with the Samsung BlackJack. My gym friend Gordon, who is considering the BlackJack, mentioned that his colleagues are happy with the BlackJack fast performance and high-speed internet access. Could the fast performance be an edge that the BlackJack has over the Motorola Q and T-Mobile Dash? I am curious about that, especially that one of the complaints I had recently about the T-Mobile Dash--after using it for several month, relates to its slow performance, especially going into my address book and looking up addresses. For now, here are a few photos of the BlackJack together with the Motorola Q and the T-Mobile Dash. The experiment continues with the Samsung BlackJack from Cingular taking the center stage for the next 9 days. Hope you will visit us again. Today is the BlackBerry 8800’s last day in my 9 day experiment with the device. I can say with confidence that the BlackBerry 8800 is an impressive business device in many ways. It offers the same reliable business features that the previous BlackBerry models offered for years, in addition to an enhanced interface, a slick design, and a host of new applications including playing music and video. So if you are interested in a smartphone for business, and not necessarily in a laptop replacement out-of-the-box, the BlackBerry 8800 is a strong candidate. Also, if you were impressed by the BlackBerry Pearl (like me) but shied away from it because it does not offer the full QWERTY keyboard (or maybe because of the camera which is not allowed through the security checkpoints of your large corporate customers for instance), the BlackBerry 8800 is the answer. 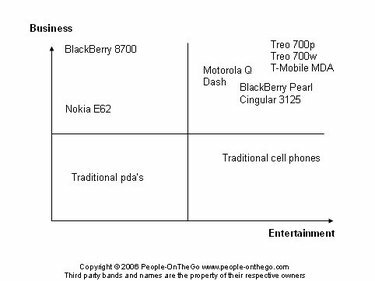 Where does the BlackBerry 8800 fit on the chart? 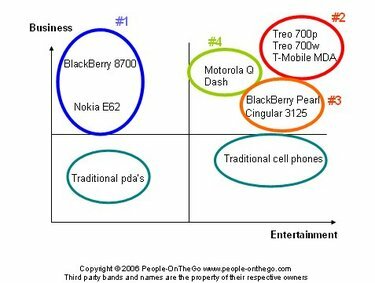 The BlackBerry 8800 seems to have crossed the business category boundary and into the business-social category--at least to some degree. The additional multi-media capabilities coupled with the new look and feel made the BlackBerry 8800 more versatile and likely to attract a new market segment. Who knows, maybe a new smartphone? Stay tuned! It actually happened. I did drop the BlackBerry 8800 on the floor today. As I was pulling the BlackBerry 8800 out of the holster, the thinner and slicker BlackBerry 8800 slipped out of my hand, and I found myself trying desperately to save it, each hand reaching to grab it after the other, only to miss it and cause it to bounce in the air even further, until it finally happened—the BlackBerry 8800 smashed into the floor. The scene was quite entertaining for the crowd who was waiting in front of the elevator--but not to me. To my surprise, the BlackBerry 8800 was still in one piece. To my surprise once again, it had no scratches whatsoever and was fully functional. This incident has proven a couple of things. First, as I mentioned in yesterday’s blog entry, the BlackBerry 8800 does not give you the same firm grip that the earlier models did, so you probably want to be more careful when handling it. Second, this incident answered my concern about the sturdiness of the new and slick design of the BlackBerry 8800. It seems that the thinner and slicker BlackBerry 8800 is just as sturdy as the earlier models. With the voice note, voice dialing, and speed dialing, and not to mention the GSP capabilities, the BlackBerry 8800 qualifies as a driver friendly device which lets you focus on the road, and yet be able to do a fair amount of communication. In addition, when you’re in need of road directions, it can easily guide you to your destination. It all sounds good, and the above features function fairly well, except for the voice dialing and the GPS which are sometimes very helpful and sometimes somehow disappointing. The voice dialing worked well initially, but as I continued to use it, I discovered that with certain names it was taking several tries to find the contact, and occasionally it wasn’t able to find it at all. Similarly the GPS worked extremely well when it worked, but on several occasions downtown San Francisco, and in the south bay on Skyline Drive, I kept getting the “Cannot get GPS data error”. Obviously this is not the function of the BlackBerry 8800 itself, but if these are important capabilities for you, it is good to be aware of their limitations. On a different but related topic, as smartphones and e-mail and text messaging are becoming ubiquitous, the habit of typing and driving seems to be developing and spreading just as quickly. Whether typing text and e-mail messages, looking up contacts and calendar, or browsing web pages, obviously these activities take the driver’s focus from the road and represent real danger for the driver and others. A few weeks ago, I made a commitment to “no typing while driving”. This means limiting my use of the smartphone to the tasks that do not require taking my attention off the road. This means voice dialing, voice notes, speed dialing, and taking calls. I invite you to do the same! The BlackBerry 8800 is now available from Cingular, and expected to be available soon from T-Mobile. However, I haven’t found yet any official information as to whether it will be available from Verizon or Sprint and when-there are some rumors though about a Verizon version that is in the works. What I found out today is that in order to get the BlackBerry 8800 to serve as a modem for my laptop, I need to upgrade from my $29.99/month blackberry data plan, to another plan that costs $74.99/month. Knowing that my Vaio SZ390P comes already with the Cingular 3G card that can connect to the Cingular network at a higher speed, I opted to try the Laptop Connect plan which costs $59.99/month (instead of using the BlackBerry 8800 as a modem for my laptop). The Laptop Connect has several advantages. First, it is faster (upload speed of 400 to 700 kbps, download speed of up to 3.6 mbps—assuming 3G coverage is available and otherwise it will drop to EDGE speed). Second, this would allow me to still use the BlackBerry 8800 to make voice calls. Third, it is more convenient—in other words, I don’t have to connect the BlackBerry 8800 to the laptop every time I want to connect to the Internet. So let us see how Laptop Connect and 3G will perform in the next few days. 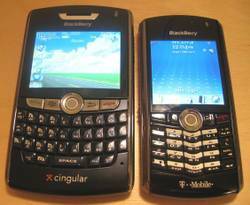 The 81-day-experiment continues with the BlackBerry 8800 from Cingular—Day #7, compared with 8700, Pearl, and more! I am on day #7 with the BlackBerry 8800. My experience so far with the BlackBerry 8800 has been quite rewarding, and as day #9 gets closer (the last day in my 9-day experiment with the BlackBerry 8800), I am starting to think about how it compares with other devices that I have used in the 81-day-experiment. Where does the BlackBerry 8800 leave the earlier BlackBerry 8700 model? Having become thin and elegant however, the BlackBerry 8800 doesn’t give you the same grip when you hold it in your hands—compared to the earlier models. When I pick up the BlackBerry 8800 with one hand from a flat surface like the top of my desk, I am afraid I am going to drop it. In addition, I find myself accidentally hitting the side key (the one on the left side of the device), which starts the Push To Talk application and prompts me to register to use the service from Cingular. I remember that day, from a few years ago, when I owned a BlackBerry 7230 and I was presenting at an event, and I accidentally dropped the device from the podium, and saw it crash into the floor and break into 3 pieces. I was extremely disappointed or maybe even shocked, not just about the thought of losing my device and my data, but also about the not-so-elegant scene in front of my audience. To my surprise, the three pieces which were the device itself, the battery cover, and the battery itself, were intact and once assembled, the device was back in business right away and without a glitch. I hope that the 8800 would withstand such an accident, but I am hoping not to have to find out. From a usability perspective, and I am referring here to navigation and data entry here, the trackball coupled with the menu and escape keys on the side, present a super easy and efficient user interface. Together, the trackball and navigation keys, have a nice and smooth feel to them and make up what I consider “the” best smartphone interface for the business user who doesn’t want to be distracted by more “choices” and more “parts” (like styluses, touch screens, 5 way navigation buttons, and more application buttons, and combinations thereof). The BlackBerry 8800 interface (trackball centric), which was introduced with the BlackBerry Pearl late last year, seems to have picked up momentum with the BlackBerry 8800, and seems to be a successful development/evolution of the trackwheel and escape button interface that the BlackBerry 8700 and previous BlackBerry devices enjoyed for year. It seems that at some point, when the rest of the service providers jump on the 8800 bandwagon, the 8800 will replace the 8700. How about the BlackBerry 8800 and the BlackBerry Pearl? 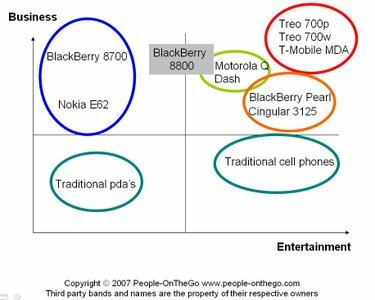 The BlackBerry 8800 is pretty much a “BlackBerry Pearl on steroid”. The looks are almost identical, except that the BlackBerry 8800 has grown a bit to accommodate the full QWERTY keyboard, and continuing with the “business” theme, it got away with the camera, keeping the device more in the business category than the social category. So essentially, the target audience is slightly different, one catering more towards the business users, while the other catering towards consumers and business users who give elegance and social functions a higher priority. Comparing the BlackBerry 8800 with more devices? In the next few days, I will continue to compare the BlackBerry 8800 with the rest of the devices. Meanwhile, if you are a business user considering a smartphone, you probably want to add the BlackBerry 8800 to the list of smartphone that you are considering. Obviously selecting a smartphone includes many factors, and the BlackBerry 8800 may or may not be the one that best fits your need, but it is strong contender in the smartphone world. The BlackBerry 8800 served me well today and on several occasions it saved me the effort of getting my laptop out and searching for a hotspot. Can the BlackBerry 8800 be also a laptop replacement for you? It depends on what you do on your laptop. If your main goal of carrying your laptop is to write e-mail, lookup calendar, and browse the internet “lightly”, in this case the BlackBerry 8800 can play the role of a laptop replacement very well. If your main goal is to create and edit documents, and do some significant work on web applications that includes logging on to your accounts, filling out forms, searching web databases, I am not sure that the BlackBerry 8800 will do the job or at least not out-of-the-box (even though some of the 81-day-experiment blog readers reported that they used add-on applications on the BlackBerry devices and were able to turn their BlackBerries into true laptop replacements with document editing capabilities as well as access to their corporate networks and databases). Are smartphones true laptop replacements? In my view, even though some smartphones (like the Treo 700p and Treo 700w which I reviewed earlier in the 81-day-experiment, the T-Mobile MDA, and the more recent Cingular 8525 and its broadband data speed) can serve virtually many, if not all, of the functions that laptops do, I still don’t believe that they can be true laptop replacements while you’re on the go. There are many functions that we perform on the go that still “require” the larger laptop screen, its full-size keyboard, and faster performance. This is not only from a practicality perspective but just as importantly from a “mindset” perspective. When I am viewing and analyzing the latest corporate data that was generated by my team, I would like to see the big picture all at once, instantly navigate to further details, then back to different views of the same data. In other words, I need my laptop. May be in the next generation of smartphones, the smartphone will be able to plug into an ultra light and foldable laptop-like accessory that has the large screen, full keyboard, and maybe supplementary processor and storage. For now, I will continue to pack my laptop together with my smartphone as I head out to the world of business. 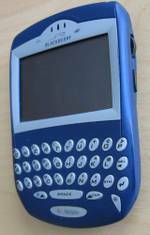 With the BlackBerry 8800 full QWERTY keyboard, I don’t hesitate to compose and reply to e-mails--something I did when using the Cingular 3125 keypad and even the BlackBerry Pearl. So even though the keys are closer together than earlier BlackBerry keyboards, it seems to be easy to get used to them and become proficient at typing. As you would except though, my e-mails written with the BlackBerry 8800, or any other smartphone, tend to be more concise. One of my colleagues once said: “I wish everyone was using a BlackBerry”—referring to the fact that e-mails sent from a smartphone tend to be to the point and tend to omit unnecessary details. The downside of course is that they sometimes omit the friendly greeting and closure, and can be perceived as unfriendly (or even cryptic if they are not well written). Having been using smartphones with cameras during and since the 81-day-experiment, I got used to this ability to document business and social events quickly and easily by taking pictures. But again, the BlackBerry 8800 remains primarily a business device, and not necessary targeting the “camera” types, and not “wanting” to be run the risk of being confiscated by security when you visit your next corporate customer. It is only day #5 with the BlackBerry 8800 and it feels as if I have been using this device for a while. It is intuitive, easy, and it just works. Obviously, and as I mentioned a couple of days ago when I described some of the keyboard shortcuts, there is more to the BlackBerry 8800 than what appears on the surface. But even if you don’t go deeper, and stick to the surface, you are likely to be quite content and able to do what you need to do using the trackball with the escape and menu keys next to it. The battery life of the BlackBerry devices continues to amaze me. In almost every device that I used in the 81-day-experiment, I could barely get by for one full day without having to recharge the battery. But not with the BlackBerry devices. It was the BlackBerry 8700 which broke the record in battery life going for 5 days without recharging--during my trip to Europe last September. With the BlackbBerry 8800 today, I am now at the end of the second day without recharging the device, and the battery seems to be going strong with over 50% left. E-mail continues to be one of the strongest areas of the BlackBerry 8800. The Messages application is where e-mail messages and text messages reside. You can even have your call logs be displayed in the Messages list. By pressing the keyboard letter T when you are in the Messages application, you get to the “top” of the list, and pressing B takes you to the “bottom” of the list. Pressing P takes you to the “previous” day messages and N takes you to the “next” day messages. Space takes you a page up and shift+space takes you a page down in the list. R will F will let you “reply” or “forward” a message. The shortcut keys don’t stop here, you can use them within a message once you open the message. Again pressing the letter T will take you to the top of the message, and B to the bottom, and P to the previous message (opening the message right away so you can see its content), while N will take you to the next message (also opening the message). And there are many more shortcuts, all designed to make the navigation and operation of the BlackBerry applications easy and efficient. I probably saved at least 15 to 20 minutes this morning by not having to lookup and print the addresses and directions for my business meetings today, and just relying on the fact that my BlackBerry 8800 has all the information I need to get going. Even after parking downtown, I relied on the BlackBerry 8800 GPS to get the “pedestrian” route to my next destination. There were a couple of areas however where the GPS could not get the data (I got this generic message indicating that the GSP is unable to get data and suggesting I move into an open area). This also happened once or twice over the weekend when I was driving on Skyline Drive. Another slight inconvenience with the GPS is that it is a little slow connecting the first time you try to retrieve the route (but then it operates nicely and smoothly). So don’t be too sure that the BlackBerry 8800 GPS is going to save you at all times, but it does its job most of the time and reasonably well. The BlackBerry 8800 proved to be a great business tool today as I went from meeting to meeting. It did the jobs that it does extremely well. While waiting in lobbies and conference rooms in between meetings, it kept me busy. I was able to take advantage of these precious minutes by getting updated on e-mail, handling some important and relatively urgent inquiries, browsing and searching for relevant information. I didn’t even have to pull my laptop out except when I wanted to work on some documents. And when I needed to schedule follow-up meetings, the Calendar shortcuts came in very handy (see yesterday’s entry). The BlackBerry 8800 comes with a whole suite of applications. In addition to the phone, e-mail, text and multi-media messaging, Internet browsing, address book, calendar, memo pad (for taking notes), and tasks, it includes voice dialing, voice notes, and pictures, music, videos, ringtones, and a number of utilities such as the famous BrickBreaker game, the alarm, and calculator. Cingular also offers the Push-To-Talk service which can transform your BlackBerry 8800 into a Walkie Talkie that you can use with other Cingular subscribers. And for those who want to stay up-to-date on news, sports, and entertainment among other topics, the Cingular Media-Net service can do the job. The BlackBerry 8800 today kept me up-to-date on e-mail, some text messaging, and a few Internet searches. The GPS was quite useful as well. With Google and a GPS on hand, all you need to know is the name of your destination, and you can then find the address and the route. Or maybe even a vague idea of what you want, can then turn into a Google search, and then some results, which can then a physical address that you can feed into the GPS. And what about that trackball in the BlackBerry 8800? If you have seen the BlackBerry Pearl, or referred to the 81-day-experiment when I was reviewing the Pearl, you know already that I found the trackball in the BlackBerry Pearl to be an easy and efficient navigational tool. The trackball now made it into the BlackBerry 8800--and with it, the return key on the right, and the menu key on the left. The trackball and these two keys are pretty much your way of navigating the BlackBerry 8800 menus and applications. No stylus, no touch screen, no 5 way navigation (even though the trackball is nothing but an elegant and more refined 5 way navigation)! And how about the keyboard of the BlackBerry 8800? I found the keys to be slightly closer together than the BlackBerry 8700, which in turn has the keys closer together than the earlier BlackBerry 7200-7900 series. At first, I was a little cautious whey typing on the BlackBerry 8800 keyboard, and thinking that I was going to accidentally hit the adjacent keys. However, I am finding out that the keys are well pronounced and have this slightly-elevated edge which makes typing easier. If you happen to be a BlackBerry user, you will be happy to learn that the shortcuts are the same BlackBerry shortcuts that you are used to in the BlackBerry 8700 or 7200-7900 series. They add yet another level of efficiency to the device. If you enable the shortcut keys on the home screen, you can then launch most of the BlackBerry applications with one keystroke, such as A for Addresses, M for Messages, and L for Calendar. If you enable the shortcut keys in Calendar, you can fully navigate your calendar with simple keystrokes such as switching to the week view by pressing W, and then navigation to the next and previous weeks using N and P, and switching back to the day view by pressing D. There are many more shortcuts, and even though they are not necessary for operating the BlackBerry 8800, they can be very useful. I will be mentioning more of them in the next few days. Stay tuned for more BlackBerry 8800 experiences this week!